Abuja, Nigeria. April 29th, 2014 - Quarter 2 2014 Special Edition poll; The State of Security In Nigeria “S.o.S” poll released by NOIPolls Limited has revealed that mixed feelings have trailed the opinions of Nigerians regarding the state of the Country’s security. On one hand, when asked to rate the current state of security in the country, majority (76%) were of the opinion that the country is not secure. However, when asked to rate the state of security in their local communities, only 34% viewed their communities as insecure; an indication that one feels safer when the danger is not in close proximity. Interestingly, a reverse of this is found in the North East region that views the country as much safer than their communities. The results also revealed that a slight majority (47%) think security checkpoints are effective in deterring terrorist attacks; while 43% think they are ineffective. With regards to the “state of emergency”, majority (59%) think that the duration of the “state of emergency” should be extended in the North Eastern states where it was imposed, however the North East region had the majority who do not want an extension of the state of emergency. Finally, top key measures identified by Nigerians to help tackle security challenges in Nigeria are ‘Unity among religious leaders’ (18%); ‘Increased security within the Country/Borders’ (15%) and ‘Better motivation of Security personnel with Good pay/Equipment/Training’ (15%). These were the key findings from the Special Edition “State of Security” S.o.S Poll conducted in the week of April 21st, 2014. Insecurity in Nigeria has remained a top challenge facing Nigeria as a country over the past few years, this is clear in what Nigerians have pointed out as key issues the President and his administration should address over the last three years. Also the current state of security in the country has affected the President’s approval ratings in the last couple of months as incessant attacks across the country continued. 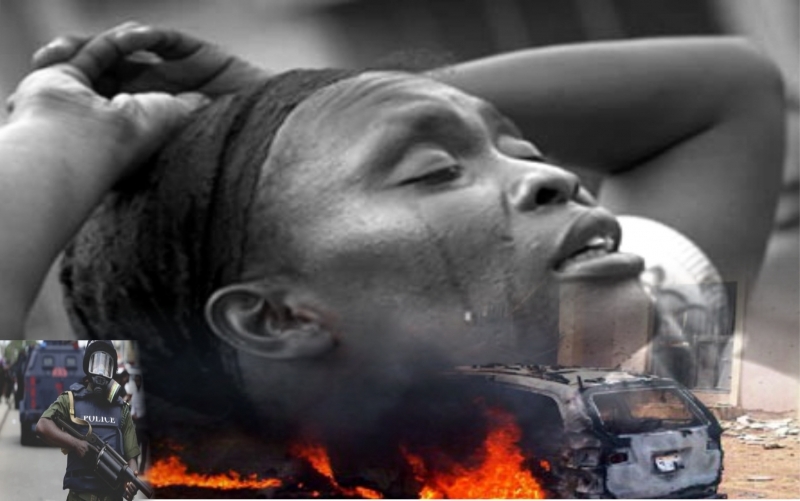 A combination of terrorist attacks, ethnic clashes and violent clashes within communities have further heightened the need to deal with the insecurity and its effect on lives and properties of the Nigerian people. Against this background, NOIPolls conducted its Special Edition “State of Security” S.o.S Poll in the week of April 21st. The main objectives of the survey were to gauge the perceptions of Nigerians regarding the state of security within their local communities and the nation as a whole. Current poll results were compared with the results of the NOI-Gallup National Poll conducted in September 2013. Please download the full survey report of the S.o.S Poll here. The first and second questions sought to determine the perception of Nigerians about security in the country as a whole and within their local communities. Respondents were asked: How would you currently rate security in the country/your local community? Survey results show that with regards to security in the country, majority (76%: 37%+39%) have a negative perception of security in the country as a whole describing it as ‘Not very Secure’ and ‘Not at all Secure’. Conversely, 24% (5%+19%) have a positive perception about security in Nigeria. The North-East has the highest proportion of residents that describe security in the country as ‘Very Secure’ (13%) and ‘Somewhat Secure’ (28%). The same region also has the lowest proportion of those that describe it as ‘Not very Secure’ (24%) and ‘Not at all Secure’ (35%). 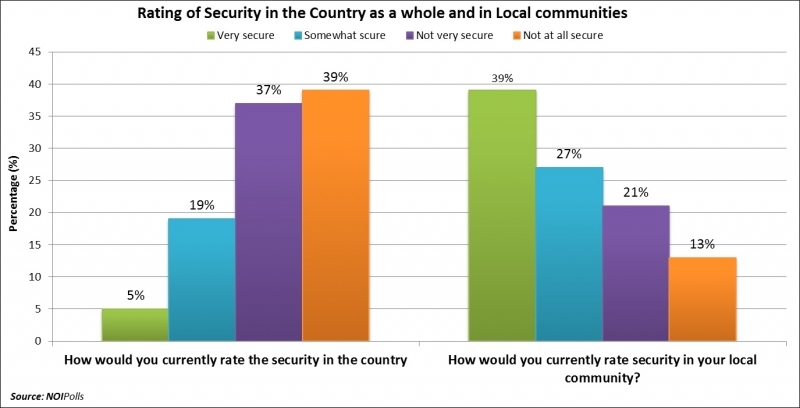 However, with regards to security in their local communities, the majority of Nigerians have a positive perception about security within their local community rating it as secure; 66% (39%+27%). In addition, 34% (21%+13%) have a negative perception about security in their communities describing it as not secure. The North-East and North-Central have the highest proportion of residents (29% each) that describe it as ‘Not very Secure’ and the North-West has the highest proportion (17%) who claim it is ‘Not at all secure’. The results from the questions show a reverse relationship between the troubled areas (North East region) and the rest of the country. Whilst all other regions view the Country as not secure and their communities secure, the North East region views the country as secure and their communities as not very secure. A trend analysis on the security in the country shows that the proportion of Nigerians that perceive the country as ‘Somewhat secure’ declined by 10-points from September 2013. On the other hand, those that indicated ‘Not at all Secure’ increased by 7-points. Again, comparing current results with the NOI-Gallup Poll reveal a steep 20-point increase in the proportion of Nigerians that perceive their local community as ‘Very Secure’. On the other hand, those that describes it as ‘Not at all Secure’ declined by 7-points. Furthermore, respondents were asked: How effective do you think security checkpoints are in deterring terrorist attacks? Findings revealed that the slight majority 47% (13%+34%) think security checkpoints are effective in deterring terrorist attacks, closely followed by 43% (29%+14%) who think they are ineffective while 10% think they are neither effective nor ineffective. From the geo-political zone perspective, the North-West zone has the highest percentage (71%) of respondents who think security checkpoints are effective in deterring terrorist attacks while the South-West has the highest proportion (59%) that think they are ineffective. Analysis by age group reveals the 60+ group has the majority (55%) of those that think security checkpoint are ineffective while the 18-25 years age-group has the majority (51%) of those that think they are effective. To ascertain the perception of Nigerians regarding the extension of the duration of the state of emergency, respondents were asked: In your opinion, do you think that state of emergency should be extended in those states? The majority (59%) think the state of emergency should be extended in the North Eastern states where it was imposed while 41% think it should not be extended. In-depth analysis by geo-political zone indicates that the North-East region where the state of emergency was actually imposed has the highest proportion of residents (64%) that think it should NOT be extended. This is also the only region where this is the majority opinion among residents. 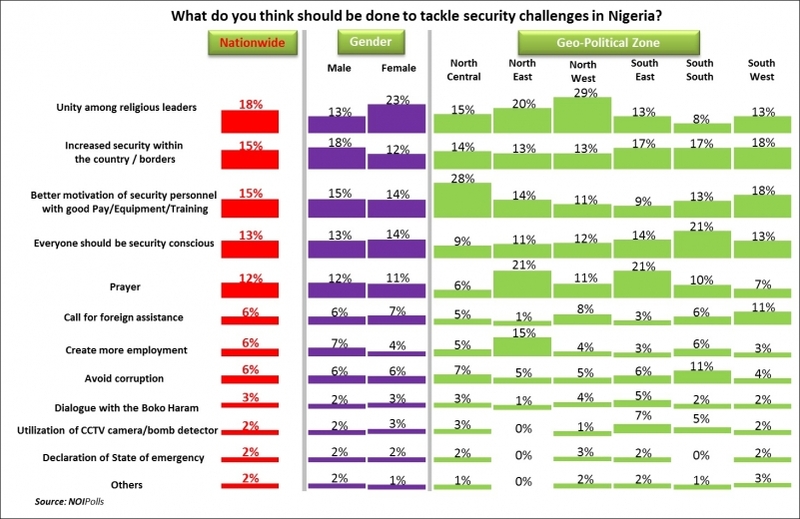 Finally, respondents were asked: What do you think should be done to tackle security challenges in Nigeria? The slight majority (18%) indicated that ‘Unity among religious leaders’ will help tackle security challenges in Nigeria. Other popular suggestions include ‘Increased security within the Country/Borders’, ‘Better motivation of Security personnel with Good pay/Equipment/Training’ (15% each) and ‘Everyone should be security conscious’ (13%). In conclusion, findings from the poll revealed that majority (76%) of Nigerians were of the opinion that the country is not secure when asked to rate the current state of security in the country. However, when asked to rate the state of security in their local communities, only 34% viewed their communities as insecure. Furthermore, the results revealed that a slight majority (47%) think security checkpoints are effective in deterring terrorist attacks; while 43% think they are ineffective. With regards to the “state of emergency”, majority (59%) think that the duration of the “state of emergency” should be extended in the North Eastern states where it was imposed. Finally, top key measures identified by Nigerians to help tackle security challenges in Nigeria are ‘Unity among religious leaders’ (18%); ‘Increased security within the Country/Borders’ (15%) and ‘Better motivation of Security personnel with Good pay/Equipment/Training’ (15%). Finally, top key measures identified by Nigerians to help tackle security challenges in Nigeria are ‘Unity among religious leaders’ (18%); ‘Increased security within the Country/Borders’ (15%) and ‘Better motivation of Security personnel with Good pay/Equipment/Training’ (15%).